October 10, 2017 October 10, 2017 Amanda B. After showing the Pick it! Write it! Build it! Work mats for letters and sight words to a co-worker, she had a great idea for me to make it as math center too. So I put together another set of that work with numbers and math sentences! Students can use this work mat with the number cards to practice their number formation skills. You can use a variety of loose parts for them to build with, and they can practice writing the number. I’ve also included a set of number word cards and a work mat with a ten frame in the “Show it!” section. Students can practice representing numbers in different ways, and can use the cards to write the number words as well as the number. This last work mat can work with the subtraction or addition cards that are included. Students can use different materials to solve the math sentences and write the solution in the space provided. These 3 work mats are great to practice different math skills. They can be used throughout the school year to help students build their number sense knowledge, and their addition and subtraction skills. 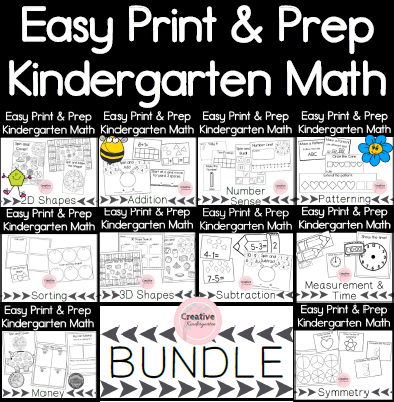 You can get it now in my Creative Kindergarten store, and get started on practicing those math skills!